As 2015 comes to an end, my miniature collection hits a big milestone: 10,000 models. I have sold a few armies over the years, but ignoring those there are now over 10,000 models gracing the cabinets of my hobby room. Of those, just over 6,000 are painted and the rest are in various stages of “pre-assembly” (I seem to get to the stage of cleaning, building and basing the models before things slow down…). 100+ fully playable smaller gangs/fleets/warbands/teams (Mordheim, Battlefleet Gothic, Blood Bowl, Necromunda, Lord of the Rings, Dystopian Wars, SAGA, Man-o-War, DBA – though some of the SAGA and DBA forces are in “army” territory in terms of size). In 2015, I bought about a 1,000 models (mostly a burst of Warhammer acquisitions – see below). I also managed to paint almost 400 models which isn’t bad but clearly a losing battle against the acquisition scale. The stats below show the distribution of models across the different game systems, as well as the “gaps” in my painting strategy. Terrain: There are 700+ terrain pieces (not included in the 10k model count). Most is done and ranges from big stuff (e.g. Mordheim buildings) to small add-ons (e.g. fences). Those pieces can be placed on over 100 sqft of modular sculpted gaming tables (plus assorted flat surfaces for space and water). Warmaster: One of my big painting gaps. I used to be “almost done”, having finished the 6 original core armies (Empire, Dwarves, Orcs & Goblins, Chaos, Undead, High Elves). Then, Specialist Games died and I bought the rest of the collection “just in case” (you know, in case 10 years after my last game of Warmaster, the opportunity to play would arise again and Lizardmen were desperately needed somehow…). Now ~500 bases of Bretonnia, Dark Elves, Kislev, Lizardmen, Skaven and Vampire Counts are starting at me from their slot in the To Do List (I did manage to get the Wood Elves done before the initial enthusiasm died). Warhammer 40k: I used to be an active 40k tournament player in the early 2000’s so this part of the collection is blessed with a number of fairly complete painted armies: Emperor’s Children, World Eater, Dark Eldar, Eldar, Imperial Guard, Blood Angels (two version), and Ultramarines. Most of the unpainted models are just “left-overs”, including the Blood Angels vehicles from my second attempt. Oh, and there is a 130+ model Ork army somewhere. But mostly 40k is in good shape. EPIC: I am doing pretty well here. Mostly due a few years of incredibly energizing “Tales of EPIC Gamers” over on the TacComs forum. All the armies are on the blog. I still have to get the Tyranids, Titan Legion and Adeptus Mechanicus done, but that’s a mere ~400 models (compared to the ~2,000 already done). Flames of War (FoW): This is the last of the “army scale” systems and, again, I am doing pretty well. Everything is on the blog with all the core armies finished. The missing models are just a few odds and ends. Mordheim/Blood Bowl/LotR/SAGA: These are “time fillers”. I paint the odd warband/team during breaks and seem to be at about the mid-point for each system. Fortunately, they are all out of production and I own every available force, so the upper cap won’t be growing much anymore. Slowly but surely, this will get done. Man-o-War/Battlefleet Gothic/DBA: The happy few. Everything is done and nothing is left to buy. Well, for DBA there is of course potentially more to buy, but all the classic forces are well represented. Romans, Greek, Seleucid/Successors, Gaul/Germanic/Britons, and enough generic medieval forces to make two armies. Overall, there are about 3,500 models left to paint. Of those, about 2,000 are of the more time-consuming 28mm scale and the rest are 10mm/6mm which should go up a bit easier. Still, this will keep me busy at the painting table for years to come (especially painting is, most definitely, a side activity in the evenings – if it were my day job then I wouldn’t make such impulse purchases in the first place 🙂 ). Wish me luck! Normally, this blog only chronicles my slowly-growing collection of painted miniatures. But I will indulge in an opinion piece for once. Game System: Warhammer Fantasy Battle has always been about mass combat of ranked units. And while Games Workshop has nibbled away at this core model in recent years with the introduction of big monsters and other “single base” additions, this was always the central principle of the Warhammer system. No more. Individual skirmish-style models, a la Warhammer 40k, are now the default. Even if Warhammer – Age of Sigmar‎ is latter augmented with a ranked variant, it will at best be in the style of the Lord of the Rings system where movement trays are merely a convenient tool for the movement of “model blobs”. And that just feels wrong. There is a reason why static formations have been the mainstay of warfare over thousands of years of human history – from ancient phalanxes to Napoleonic lines. Absent radios and rapid-firing guns, static formations are simply the most efficient way to command, control and fight units! The perfectly neat squares of the Wargaming world are of course an abstraction, but pre-radio/gunnery wargame generals really should have to worry about formations, flanks and manoeuvre. Because without that, combat will just devolve into pushing everything into a giant hand-to-hand combat blob in the middle of the field. Narrative: Changing the fundamentals of a 30+ years old game system clearly wasn’t enough, so Games Workshop also threw out the entire Warhammer World. Gone are the Empire, Bretonnia, Ulthuan and the Grey Mountains. The world that gave us the adventures of Gortrek and Felix, Teclis and Tyrion, Nagash and the van Carsteins, as well as countless other heroes and villains – all gone up in flames. A world that was literally decades in the making, and has a more comprehensive background development than possibly any other fantasy narrative and hundreds of books covering it, has been wiped out in one stroke. And I don’t get it. Over the last year I have been watching the End Times release cycle which narrate a cataclysmic ending to the Warhammer World, but I always just thought of it as a kind of appendix to the overall narrative. A bit like the world of Warhammer 40k describes the final battle where the Primarchs arise to fight once more – a hinted-at ending to the narrative but not a literal ending. Instead, Games Workshop appears to have decided to literally end the Warhammer World. I can, abstractly, understand that the game developers might want material for new creatures and battles, but why not do so by selecting a different slice of the Warhammer World timeline? Mordheim comes to mind as an example. Similarly, Warhammer 40k has quite comfortably created a full second narrative in the 30th millennium with their Horus Heresy saga. The Horus Heresey opened up room for new models, new design paradigms, new forces and a new story line of breathtaking depth. All without abandoning the core of the 41st millennium narrative. Why not do the same for the Warhammer World? There are plenty of alternative fantasy game systems out there that offer equal or better gamepla‎y to Warhammer. Game rules are relatively easy to create so there will always be small businesses with new rule sets. Making good quality miniatures is also, quickly, becoming accessible for smaller companies. So what really set Games Workshop apart were its massive franchises around the Warhammer and Warhammer 40k worlds. Those took decades to develop with a combination of rule sets, background books, fiction books, magazine articles and many other tools far outside of the budget of a new independent game developer. Throwing this away seems foolhardy in the extreme. And all of this wouldn’t be so bad if the new narrative were inspiring. 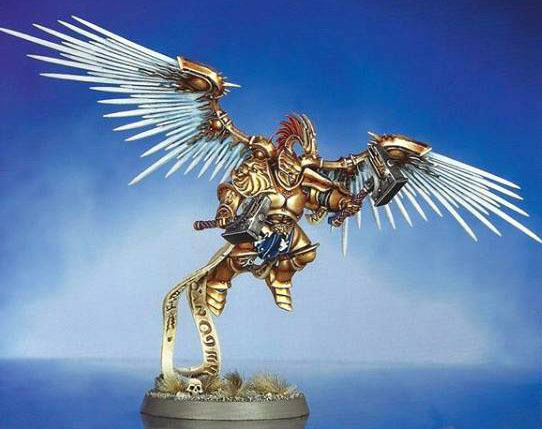 Instead, we get golden-armoured winged angel warriors led by a god-emperor into battle against their chaotic counterparts across random worlds? Really? That’s replacing the depth of the Warhammer World?‎ I get Games Workshop’s obsession with Space Marines but that really feels about as lazy as story writing can get. Ironically, I just finished painting the Sanguinary Guards for my 40k Blood Angels so I guess I can easily put together a proxy force for the new Age of Sigmar :). Intellectual Property: ‎As depressed as I am by the above changes, this one really takes the plum. Not only is the Warhammer World gone up in flames, but Games Workshop has also decided to shift its entire intellectual property portfolio. Orcs are now Oruks, Elves are Aefls, Dwarves are Duardin, Lizardmen are Seraphons, and so forth for ever-more awkward attempts of generating unique nomenclature. This is truly crazy. ‎Believe me, I get that Games Workshop wants to own proprietary terminology for its games. While I am not an expert in the legal aspects of miniature games, I actually do make a living with intellectual property (the technology kind) and worked at/with some of the most recognized intellectual property brands in the world (including working at a company who makes more profit from IP licensing than Games Workshop cumulative from its entire business since the creation of the Warhammer World some three decades ago…). So I get the value of strong intellectual property and the need to protect it. But Games Workshop’s current approach seems to be very misguided. A successful brand strategy depends on two slightly opposing elements: penetration and protection. The latter is obvious – you need to own the intellectual property rights of all or some of the new material to exploit it commercially – but the former requires a bit more thought. To build a strong brand, you need to create something that penetrates the market quickly and dominantly. The best way to achieve this is to leverage historical brand strength as well as common concepts that are already in the market. That’s where the conflict with protection comes in because, by definition, those common concepts can’t be protected. But despite that trade-off, this is still the best way to build a strong brand. Hence, Apple, the most brand concious company in the world, still has an “App Store”‎ and an Apple Watch – not a “Aeph Shtore” and an “Apple TimeTeller”. Similarly, Dwarves are a deep stereotype of all fantasy worlds – doughty warriors of short stature who dwell under the mountains and love gold. Either, the new “Duardin” will have those characteristics or they won’t. If they do then they will be referred to as Dwarves and if not, then there won’t be Dwarves in the new “Age of Sigmar” universe. ‎Even Tolkin, a professor of philology obsessed with new nomenclature, understood this. That’s why there are Dwarves in Middle Earth who are sometimes called Durin’s folk and occasionally wander in the Druadan Forest to meet up with the Dunedain. Because that’s how this is done. You leverage archetypes of existing common elements and then add unique people, places and cultures to create your own intellectual property. That’s, ironically, how the Warhammer World became such a successful franchise in the first place! And give the example of Middle Earth as possibly the most lucrative fantasy world intellectual property portfolio ever, it is clearly a strategy that can also be monetized just fine. In summary, this seems like an extremely misguided strategy. Introducing a new game system is a good move – Warhammer was due for a face lift – but killing one of their two largest franchises seems patently insane. And regrettably that move will destroy the foundation of many co-dependent games as well. Warmaster, Mordheim, Blood Bowl, and long list of video games all draw upon the Warhammer World as its setting. Eliminate that world and its creatures, and you pull out the rug from beneath all of these games. Incidentally, this raises the interesting question of how Games Workshop will be treating upcoming games based on this settings. For example, the Total War franchise of video games appears to be working on “Total War: Warhammer “and, at least in the pre-release info, Orcs are still Orcs (not Oruks). It will be interesting to see whether Games Workshop ‎allows the parallel existence of two “Warhammer Worlds” or will try to force the Total War franchise to shift to the new narrative (a clash of titans since the Warhammer and Total War franchises have probably similar value right now and similar annual revenues). ‎As a long term gamer who was captured by the Warhammer World narrative almost 30 years ago, this change makes me sad. As business man, I just find it baffling that any company would abandon the foundation of a large franchise in this way. It truly is the end of an era. As a tribute to the Warhammer World of old, I will be (finally) preparing some of my Warhammer forces for the photo booth and get them up on this site over the next couple of months. From Imperial Dwarves to the hordes of Undeath and the valiant men of Bogenhafen, let’s unleash the visual spectacle of the Warhammer World for one last hurrah! Looking back, 2014 was sadly aa very quiet year for the blog (and, associated with that, my gaming productivity). A combination of “Space Marine Fatigue”‎ from my overly ambitious 40k Blood Angel force and just generally a lack of painting time made 2014 probably the least productive year of the decade. So I wanted to start 2015 with a resolution to step up the painting rate again. 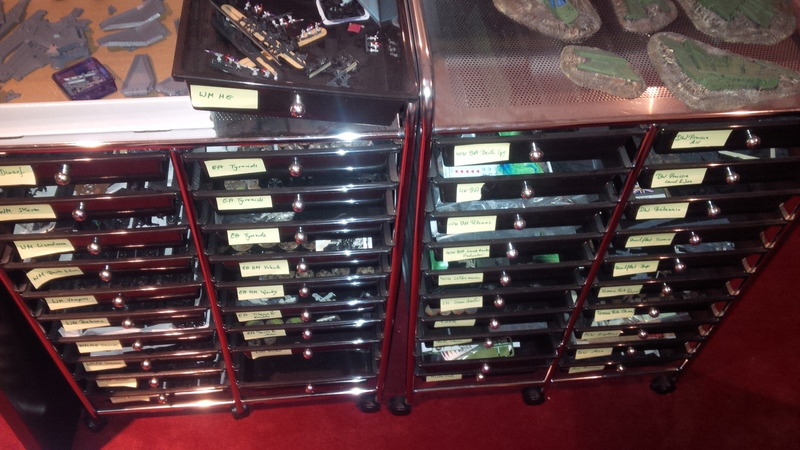 Specifically, I am hoping to tackle at least some of the projects that have been lingering in my “active projects” cabinet for a while (yes, I have such a cabinet with some 40+ drawers full of “active” projects… see picture). Blood Angels: I really want to finish these just for the mental achievement of seeing it through. I am missing some finishing touches on a few of the “red” infantry, a dozen Terminators, the Death Company and all the vehicles (4 Rhino/Predator/Whirlwind magnetic chassis, a Death Company Rhino, a Land Raider, a Vindicator ‎4 assorted Dreadnought, a Drop Pod and a flyer). Other Projects: The same “fit of airbrushing enthusiasm” that led to the Blood Angel project also saw me pick up 200 or so Ultramarine models. I also still have a large 300+ model Ork army left but I doubt that I will even start either of these in 2015 to preserve my sanity. Empire: About a decade ago I participated quite actively in the North American Grand Tournament circuit and even picked up a few awards. My Empire army from that era was painted to my (then) best quality which means that it is still adequate today. My goal for 2015 is to finish up the few remaining units and photograph the army for the blog (gotta get some 28mm forces up here!). Tyranids: about 10k points all based and ready for painting. Adeptus Mechanicus: all ready to go but 100% proxy models. Not sure if TacComs would allow images of those these days. Titan Legion/Knight: 8 Titans and some 20+ Knights waiting to be done. Other Projects: I don’t actually own anything else for EPIC but the recent release of Dark Eldar and Sister of Battle proxies by Onslaught Games is really tempting (so are their Tyranid proxies but I have those already). Maybe I will pick up a small force of each just for fun. Warmaster ME: Rohan, Gondor, Isengard, Sauron‎, Battle of Five Armies box. If I am particularly productive, I might reward myself with a Chaos Dwarf or Beastmen force from the awesome Eureka line. I have always been intrigued by historical settings but starting another huge army never seemed appealing. Along came SAGA – a Dark Age skirmish game. As usual, enthusiasm got the better of me and I bought a few hundred models from Gripping Beast, Warlord Games and Wargames Factory (thus utterly negating the small model count benefit of a skirmish game…). At minimum, that’s enough to build decent sizes warbands for Saxons, Danes, Viking, Jomsvikings and maybe some Welsh or Scots (for once, I didn’t really plan much beyond getting all the available plastic kits and some metal models – historical models are dirt cheap to somebody used to Games Workshop prices so I just bought all the available boxes from the three manufacturers). In 2015, I hope to finish at least two of these warbands. Talking of skirmish games, I still have lots of Specialist Games groups in assorted boxes. Ideally, I would like to paint a couple of these in 2015 but SAGA will take precedence. So, finish a 40k and Warhammer army each, an EPIC army, a couple of Warmaster armies, a couple of Saga warbands, a couple of other skirmish game warbands. Maybe 400 models which seems somewhat manageable in a year. We will see :). Wow, it’s been a long time. A full year since my last post. I blame the Blood Angel project. In the fall of 2012 I had this crazy idea that I would do another 40k army. I built quite a few of those in the earlier part of the last decade, even won a number of Grand Tournaments. Eventually I shifted interest back into the smaller scales and left the world of 40k behind for close to decade. But the interest lingered, and all those videos of beautiful armies on the internet eventually won me over again. So I bought a few hundred models and went to work on a Blood Angel force. And it was painful. I made the big mistake of approaching the this project like one of the many 6mm or 10mm I built in the last decade: assemble everything, base coat everything, detail everything, finish. That works great for an EPIC or Warmaster force where I can bang out the entire force in a couple of months. For a 200+ model 40k army it drained me of all motivation within weeks. Detailing the 200th shoulder pad kills you inside. The only thing worse is finding out that @#$%#%^#$% Games Workshop doesn’t make their metal shoulder pads at a consistent size scale, thus forcing you to throw away and paint a new batch of 200 shoulder pads (yes, it happened – and assembly line painting of course only discovers this at the end of the line…). Eight months into the project, I still didn’t have a single model truly completed. Big mistake. The second demotivating factor was the development of 40k over the last year, or at least my perception thereof based on what I see online. Instead of a visually appealing skirmish battles in the 40k universe, the 40k game seems to have become an exercise of pushing as many disconnected models onto the tabletop: flyers on a tabletop not even large enough to be their airfield; alien monsters fighting side-by-side with humans; armies with more characters than troopers; tanks that drive sideways; and, worst of all, Blood Angel armies that sit back on the base line. It has become a truly weird game – and looks even weirder when you watch it. Between these two factors, motivation slowly drained out of me and the project stalled. And with it all other painting projects stalled as well. At least until a few weeks ago when I summoned the energy to jump back into the fray and finish at least a few models. I gave up on the vehicles, for now, but will be slowly wrapping up the infantry units (and post them here). First in line is Mephiston, or at least, my proxy thereof. The real model is quite dated so I made this from the Dark Angel Librarian, a Space Wolf head and assorted bitz. It’s time to look back at the wargaming achievements of 2010. It was a fairly busy year for me in “real life” so my painting progress suffered accordingly. Nevertheless, I managed to paint 595 models (about 45 per month). The theme of 2010 was clearly Epic with 505 models completed. More minor contributions where made to my Battlefleet Gothic, Blood Bowl, Man-o-War and Mordheim collection. Separately, I also managed to complete 66 terrain pieces (mostly Mordheim items). Unfortunately, the impact on the lead mountain wasn’t very impressive. Overall I purchased close to 1000 new models during year (80% of which for Epic). I did manage to sell a bunch of truly ancient Warhammer and Warhammer 40k stuff so the overall net gain is only 507 models. My painted to all ratio has therefore been slightly improved from 64% in January 2010 to 68% in December 2010. Current total (painted & unpainted) stands at 7027 models and 721 terrain pieces (of which 4618 and 659 are respectively painted). Below are my progression over the last decade in terms of overall and painted model count, as well as the current status per gaming system. I took a few more picture sets with me on my travels. Processing them is a painful, especially the completely unnecessary busy-work on WordPress.com. For some reason I can only embedded images one at a time so apart from having to edit the HTML at the end, I also need to go through half a dozen menu clicks for each images. Galleries are easier but not very useful for this type of site. Leave a comment to let me know what you would like to see first. DBA was the last “quick upload” (relatively small number of pics per army). I have photographed all the bigger smaller scale armies (Epic Orks, Chaos & IG; FoW US & UK, Warmaster Chaos, Empire, Dwarf & Undead). I am away from home for the next few weeks but will take the pics with me for long sessions of GIMP work while traveling. After that I need to tackle the 28mm armies (WFB & 40k) which will be a bit of a challenge. I can’t achieve a deep enough depth of field with my camera to get more than 3 ranks of 28mm infantry and photographing WFB infantry row by row doesn’t seem reasonable. I might need to figure out some alternative technique to get the big blocks into a photo. Probably some form of zoomed out shots with lots of cropping (lower resolution but deeper field). We will see how that works. Any tips on photography would be appreciated. My new online experience is (sort of) up and running. I will be adding pages slowly over the next few weeks as I get a chance to photograph and upload. Please leave your comments regarding the site itself, layout, style, etc. Comments on the actual content are of course very welcome as well.